After prepping, launching, chasing, and retrieving, the final step is to measure the AirCore sample for atmospheric trace gas species: carbon dioxide (CO2), methane (CH4), and carbon monoxide (CO). To do this, we hook up our AirCore to a trace gas analyzer that measures CO2, CH4, CO, and water vapor. What an AirCore sample looks like on the trace gas analyzer. 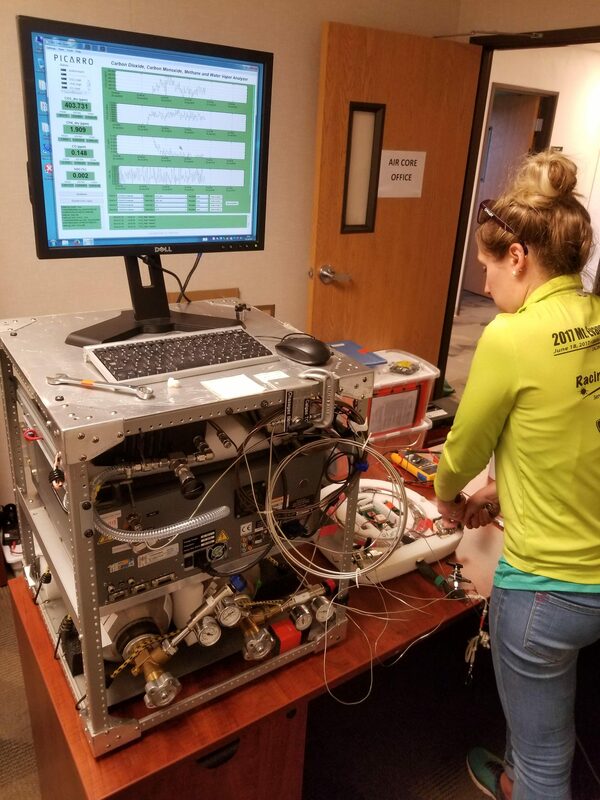 As mentioned in “What is an AirCore?”, an AirCores is prepped before flight by filling it with air that has very high amounts of CO in it (much higher than atmospheric CO abundances, so that we can distinguish ambient air from the fill-gas air). As the AirCore ascends and the atmospheric pressure drops, most of the fill gas flows out of the tubing, but the small amount of fill gas remaining at the end of the tube is used to “mark” the top of the AirCore profile during analysis. We effectively push the AirCore sample through the analyzer during analysis with this same fill gas. In this way, the fill gas is also used as a marker to locate the bottom (or lowermost atmospheric sample) of the AirCore. Thus, we effectively “play back” the atmospheric trace gas abundances collected at different altitudes in the atmosphere much like a tape recorder. After measuring the AirCore sample, we then have an idea of what the trace gas species levels are throughout the atmospheric column, but the final step in creating the actual AirCore profile (i.e. 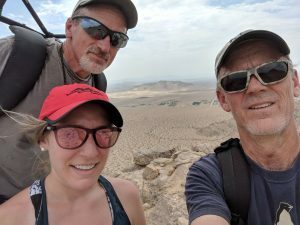 mapping the trace gas levels to an altitude) is to use the data from the analyzer, alongside meteorological and GPS data, to match the CO2, CH4, and CO levels sampled by the AirCore to their appropriate vertical levels in the atmosphere. 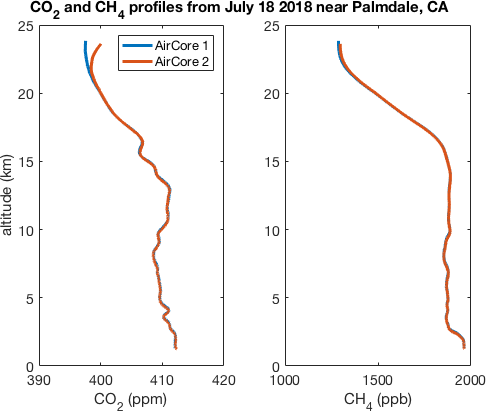 A major benefit of the AirCore system is that we can effectively and affordably sample atmospheric greenhouse and trace gas species to approximately 100,000 ft., thereby capturing over 95% of the atmospheric column. One of the uses of the data collected this summer will be for comparing to the total column, trace gas abundances measured by the upward-looking Fourier Transform Spectrometers that we mentioned were also part of this 2018 Roadtrip. However, satellites such as the Orbiting Column Observatory also measure column CO2 abundances, and the use of AirCore data is critical to evaluating these satellite data. 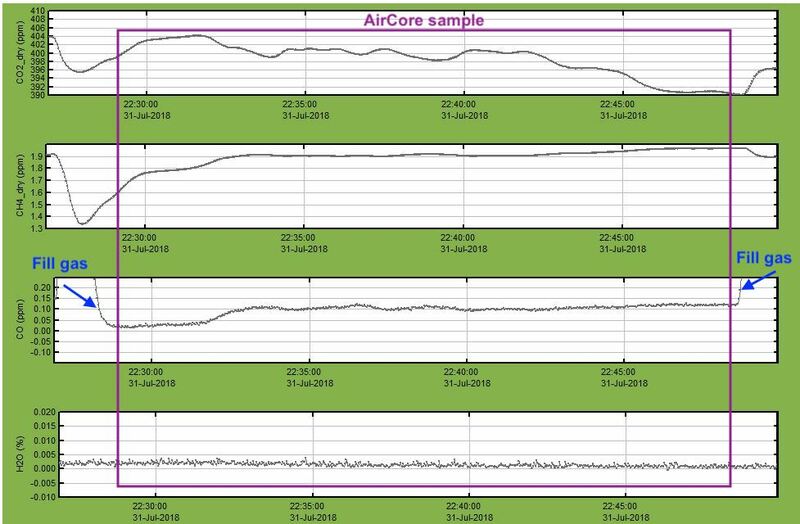 Resultant AirCore profiles from a balloon launched near Palmdale, CA showing good agreement between the two AirCores on the payload.